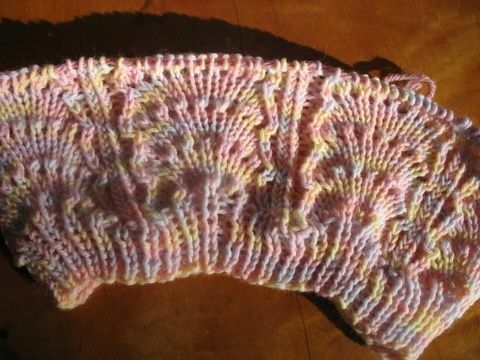 This is the shell pattern as it is knitted. The 1X1 ribbing at the bottom of the sample is not part of the shell pattern. This is the shell pattern used for a simple hat. Again, the 1X1 ribbing at the bottom is not part of the pattern. This sample was knit on 4mm (US 6) needles with DK weight yarn. Note: This is a preliminary pattern and needs someone to test it and make corrections. The front part is knit flat. K3 stitches at the beginning and end of each shell pattern row. 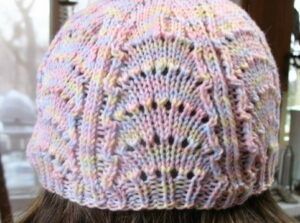 This will not be repeated in the pattern (work in shell pattern stitch only once you start knitting in the round). Knit 4 rounds garter st.